BBC News Online highlights the key acting figures in the development of the British film industry. He has struggled to win over the critics but he remains the closest thing Britain has to a genuine screen idol. And like any idol, his personal life has sometimes overshadown his professional life, perhaps to the detriment of his career. His relationship with Liz Hurley was the main focus of attention for some years and even though they have now parted Grant remains a tabloid favourite. A graduate of Oxford University, his comic talents seem more sympathetic to the talents produced by great rival Cambridge. His first film roles were in 1987's Mischief and Maurice, which helped typecast him as a upperclass twit, with floppy hair, an image he has struggled to shake off. 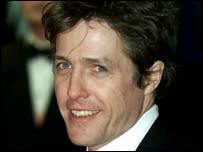 One of the few British stars to have genuine transatlantic appeal, his career took off with the success of Four Weddings a Funeral, which he followed up in the quasi-sequel Notting Hill. The two comedies are among the most successful British films of all time. While not straying too far from the kinds of roles which made him famous, he received widespread acclaim for his role in Roman Polanski's Bitter Moon. A relatively bare awards cabinet contains a Bafta for best actor, for Four Weddings and a Funeral, and a Golden Globe for best actor in a comedy for the same film.